Rising electricity prices have become by far the most important concern for Ontario voters: more important than heath care, jobs, the economy or taxes, according to a recent poll – and could very well sink the Liberal Government’s hope to retain power in next year’s provincial election. This piece explains how policy and administrative decisions by different provincial governments over the last fifteen years gave rise to excess electricity generation in Ontario with an inflated cost structure, leading to higher electricity prices and increased inequality. Like most other provinces, Ontario historically had a variation of the traditional vertically-integrated public utility that provided generation (creation of electricity), transmission (transport) and distribution (delivery to consumers) on a monopoly basis. In 1999, to facilitate competition and privatization, the Conservative Government split Ontario Hydro into Hydro One (provincial transmission and distribution in rural areas), Ontario Power Generation (OPG) and other entities. Distribution in most urban areas continues to be provided by municipal and private companies. 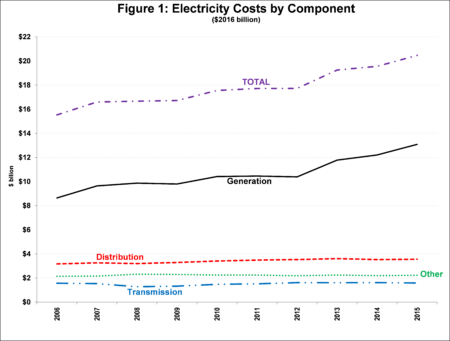 Figure 1 shows that since 2006, total system costs increased one third to just over $20 billion. Generation is the largest cost component (three-fifths) and has increased by over 50% since then. In contrast, the other cost components (transmission, distribution and other e.g. conservation, etc. ), which account for two-fifths of the total, have only increased by about 7%. 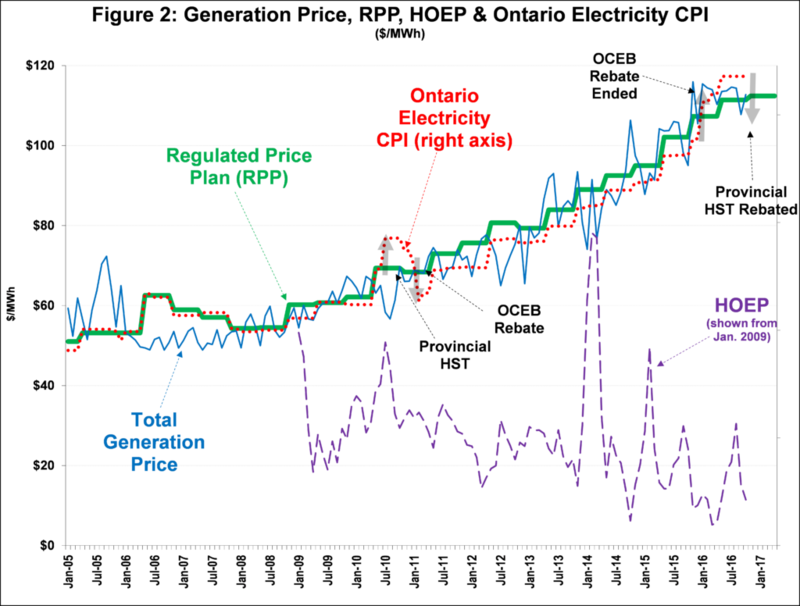 Figure 2 shows consumer prices have increased in tandem with the total generation price and highlights how Governments have used tax revenues to delink consumer prices from the underlying (wholesale) price, the Hourly Ontario Energy Price (HOEP). The Regulated Price Plan (RPP) is the retail price for households and small businesses and is calculated by the Ontario Energy Board (OEB) to recover an allocated portion of total costs; it has increased 111% in the last decade. The Ontario electricity CPI has increased 74%. 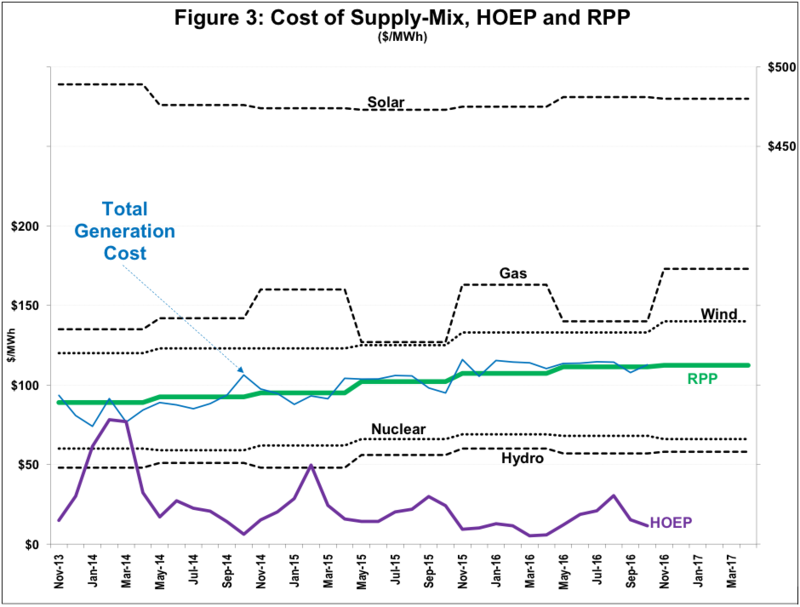 As set out below, the HOEP is one of two components of the total generation price, and has been well below the latter since 2009. The first large-scale use of tax revenues was over the 2002-2004, period when the Governments of the day imposed “price caps” on retail prices, with the Government paying generation companies the difference between the wholesale and retail prices (about $1 billion). In July 2010, the Liberal Government introduced the 8% provincial portion of the Harmonized Sales Tax (HST), but “refunded” much of the revenues via the 10% Ontario Clean Energy Benefit (OCEB) rebate over the 2011-2015 period. The electricity CPI will decrease again in January 2017, as the Liberal Government has eliminated the provincial portion of the HST (about a $1 billion/year). As conceived by the Conservative Government in the mid-late 1990’s, Ontario’s competitive generation market, introduced in May 2002, would also eliminate Government-led investment and operational decision-making and rely on private sector-led market mechanisms to promote efficient consumption and private sector investment. As noted above, the consumption efficiency objective lasted only a few months: the Conservative Government relented in the face of public outcry over paying the wholesale HOEP and introduced the retail price caps, which were then replaced by the RPP in 2005. The subsequent Liberal Government gave up on the investment objective when it introduced the current “hybrid” market in 2005. The policy called for a shutting down, privatization or “de-control” of most of OPG’s assets, with new and replacement generation coming from contracted private independent power producers (IPPs). Policy-makers could have chosen other ownership mixes or regulatory options with different efficiency and distributional results. For example, they could have replaced the market-based approach with a regulated utility scheme, wherein IPPs are subject to “cost-of-service” regulation established by the OEB. Instead, the Liberal Government decided to generally pay IPPs based on fixed-price, 20-year contracts signed with the newly-created Ontario Power Authority (OPA). These contracts are not subject to OEB regulation; rather, the Ministry is responsible for ensuring they represent value for money. Price was sometimes established as part of a competitive process, but more often it was set administratively by the Ministry. In spite of eliminating much of its policy rationale in the 2005 reforms, the Government maintained the wholesale generation market and HOEP. Not wanting to repeat the 2002-2004 experience of the Government having to finance the difference between the wholesale and retail prices, it introduced an “out-of-market” compensating mechanism, the Global Adjustment (GA) in 2005. Rate-payers pay the HOEP and the GA, which together makes up the total generation price of electricity shown in Figure 2. That same Figure shows that the HOEP has declined since 2009 in response to increased (excess) generation and currently makes up a small fraction of the total generation price (with the GA making up the difference). Currently, most IPPs receive most of their revenues not from selling electricity in the wholesale market, but rather from the GA. The 2002 market reforms were intended to transfer investment and operational risk/reward to the IPPs. The 2005 “hybrid” market maintained most of the reward with the private sector and transferred most of the risk back to rate and tax-payers. Unsurprising, virtually no new private sector generation would occur in Ontario other than via OPA contracts. To address the risk (to IPPs) of excess generation, many contracts pay IPPs even if they are required to curtail supply. Given this risk/reward profile, IPPs were eager to invest in Ontario. The Ministry had the responsibility not to over-procure. Nevertheless, installed capacity increased by about 20% at the same time that Ontario demand declined about 5-10%, thus driving up per-unit generation prices. Payments for curtailed supply, rising exports and a steadily declining HOEP since 2009 are symptomatic of excess capacity. The Government did not appear to have considered the risk of excess capacity and thus did not include provisions in OPA contracts to share such risk between IPPs and rate-payers; the risk is mostly borne by rate-payers. The other driver of increased generation costs has been a change in the supply mix and how it has been paid for. The Liberal Government phased out about 7.5 TW of OPG coal generation and replaced it with about 13.6 TW of new, mostly IPP generation (6.6 TW of renewables, 5.7 TW of natural gas and 1.3 TW of nuclear). 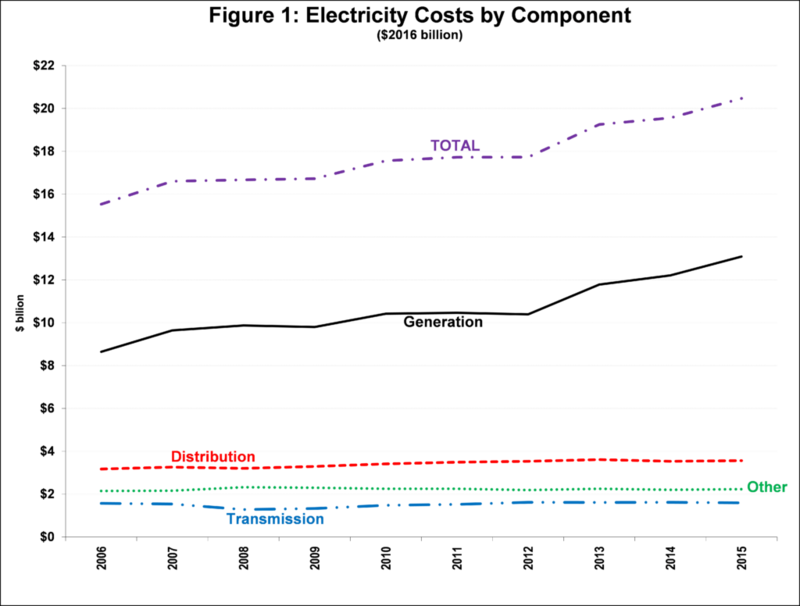 Figure 3 shows the average contracted price for the different types of generation used to calculate the RPP. Going-in, the Government knew that any new generation contracted above the average existing price will increase that price. For example, pursuant to the Green Energy Act (GEA), the Ministry established the first round of the non-competitive “feed-in tariff” (FIT) prices at $450 and $800 MWh for wind and solar. Rate-payers are still paying these comparatively inflated prices. Current prices are much lower – e.g., the recent competitive large renewable procurement (LRP) process resulted in prices of $85 and $155 MWh, respectively. The Government did not appear to have considered the risk of fixing prices for 20 years in a technologically-dynamic sector such as renewables and thus did not include provisions in OPA contracts to share such risk between IPPs and rate-payers; thus, the reward of technological advances in renewables generation accrues mostly to IPPs. 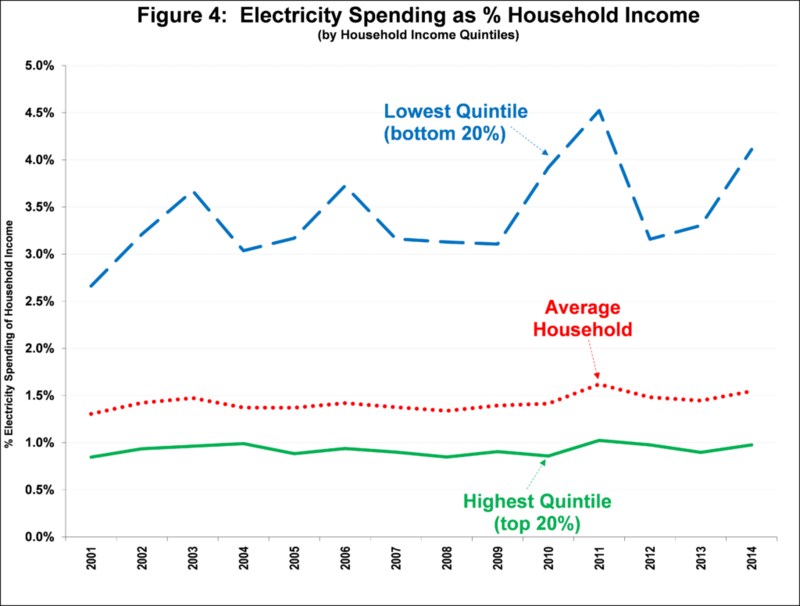 Based on Statistics Canada data, Figure 4 shows electricity spending by household income quintiles (each quintile having 20% of households ranked by income) as a percentage of respective income. 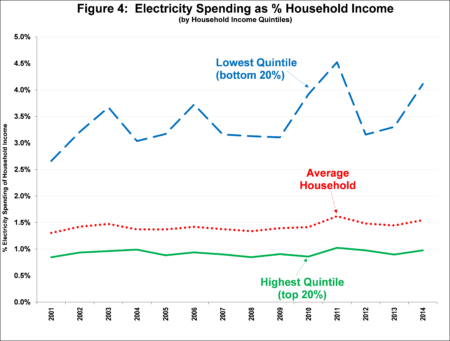 The lowest income quintile households have seen electricity spending trend upwards by more than fifty percent from 2.7% to 4.1% since 2001. Because incomes for the highest income quintile incomes have increased significantly, electricity expenditures for this group have been steady at around 1.0%. Rising electricity prices have increased inequality in Ontario as lower-income households have had to devote a growing proportion of their income to electricity. In contrast, higher income household comparative spending has not changed. Excess generation and inflated cost structure. No new or replacement generation should be procured except under an adopted long-term energy plan that has been approved by the OEB. In the future and in the long-term, any such new OPG or IPP generation should be cost-of-service regulated by the OEB as a utility, rather than via an OPA (now the Independent Electricity System Operator – IESO) contract. OPG’s assets are, and should continue to be, cost-of-service regulated by the OEB. In the short-term, the Government should direct the OEB to undertake a comprehensive review of existing OPA/IESO contracts and IPP financial performance, with the objective of recommending a course of action to ensure a fair and balanced sharing of risks/rewards between rate/tax-payers and IPPs, aimed at lowering the cost to the former. Such a review could include amending existing contracts and/or transitioning in the longer-term to a utility model subject to OEB oversight. Improve OESP design. Across-the board Government subsidies such as the OCEB and the HST rebate are inefficient compared to targeted programs that can address affordability at lower costs. In January 2016, the Liberal Government introduced the Ontario Electricity Support Program (OESP), a rate-payer funded program that provides on-going subsidies to eligible low-income households. As of November 2016, however, only about 25% of eligible households had applied and been approved for the OESP. One option to increase participation is to expand eligibility to include currently-excluded low-income households that do not pay electricity directly, but rather bundled as part of rent. Further, experience suggests program eligibility is more effective than income-tested eligibility, so the Government could expand OESP eligibility to automatically include participants in provincial social assistance programs (i.e. OW and ODSP). In the longer-term the overall size and design of the OESP should be reviewed to ensure it is achieving its objectives. Hm. So, given the glut, if the government were to transition to buying the power at wholesale rates, the producer companies would be losing money and their value would drop rapidly. The government could then buy them back on the cheap and re-establish a public model. Figure 3 is interesting, but I’d be interested in understanding the actual contribution of different sources to the price the consumer pays. For instance, while the price of solar is shown as very high (for MicroFIT projects in particular) the total contribution of MicroFIT projects is likely very low because 1000’s of very small projects at high price is still a relatively small cost in the big pool. Did the author come across, or can he develop the calculation of actual contribution of each technology to the final cost to consumer? Does Figure 4 refer to Ontario data or Canadian data? Thanks Nick, it is Edgardo (Toby guest-posted the piece). Figure 4 refers to Ontario. Jake, I am crunching the numbers you enquired about and expect to put something up in a few days. Purple Library Guy, yes that would certainly be one approach. The risk with this and other similar options is that some IPPs could seek compensation from the Govt (ultimately tax-payers) in the courts for breach of contract. The cost/benefit of such an approach would have to take into account the expected compensation (taking into account all the tools at the disposal of the Govt) versus the savings. One of the challenges for us on the outside is that many of the large contracts are confidential and hence we cannot assess the compensation and other clauses, so there is also uncertainty (which increases the risk-adjusted cost side of the equation). Adding onto this unless I missed it- is the time usage and its effect on income. Most lower income now try and arrange their day on low demand times- which again piles onto the unequal costs both direct and indirect. The one cost that truly blows me away is the cost that we must pay for getting rid of surplus energy to the US. We must start builing ways of storing the excess energy- otherwise there is no incentive to innovate with intermittent power supplies. There are many cases in other regions where new forms of energy storage are occurring. Not sure how many people trully understand energy costs and the actual existing practises. We need to stop having costs to spin of un-needed supply and store it. In the long run it is a no brainer- why we are not proceeding with such is beyond me. I do know there are so smaller experiments in Ontario but they are small pilots. We need to be much more serious about such. Jake, this is the follow-up work. In Figure 3 I focused on unit cost differences between each technology and how each compared to the RPP (average consumer price) – that is, a unit cost contribution. There are indeed a number of studies looking at absolute contribution, that takes into account unit costs and the number of units. I crunched my own numbers below. An interpretive note on these numbers – recall I argued that excess supply is probably as important or more important as supply-mix costs differences. The analysis below only looks at a latter and ignores the former. A comprehensive analysis would also look at how each technology contributed to that excess supply. That is a time-consuming process and I may consider it as a follow-up for a future full-blown post if I have the time, can get the data and there is wider interest. Looking at this way, Solar is 2% of total supply but makes up 12% of total costs. Paul, yes, absent large-scale and low-cost storage solutions, the incorporation of intermittent technologies have increased overall generation costs directly and indirectly. Directly in the sense of my supply/cost response to Jake above. Most analysts consider that it is a matter of decades before large-scale and low-cost storage solutions may be incorporated. Given the record I describe above of how new technologies were actually introduced in practice – that is via unregulated private sector IPPs – we would have to be very vigilant as to future policy and administrative arrangements to make sure that the economic benefits of any technological advances in storage accrue mostly to rate-payers (in the form of lower prices), rather than to IPPs in the form of profits above a regulated return. This correction does not change any of the other numbers in the post or alter my conclusions. Thanks again to the observer.